This album of garage music with a comfortably steady beat, and constant rocking feel to it, is a great little collection of songs. "I Got to Tell You" is a swaying commotion of a song over a constant bass line that lays down a foundation of groove. 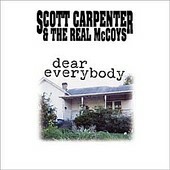 Like a little album that could which has finally reached cruising speed and is comfortable enough to play around a little bit, Dear Everybody presents Carpenter and The Real McCoys like the Stones without the ego or the age, a Tablespoon of the Clash peppered with the feel of American Honky-tonk. "Runnin' Down The 2 Lane" sounds like Southern Culture On The Skids, played out of an old stereo with dirty speakers, that gives it more of a Rockabilly jive to it. You can tell this just a group doing what thy love and not worrying about being too fancy about it. Rating: A-.